Our LASE 201C Crank-up Speaker Stands help lighten the load.With most speaker stands, you set the shaft-height first, then try to balance the speaker cabinet on top. This is difficult and dangerous,Power Crank stands are different. You mount the speaker first, then extend the shaft. There's no need to reach over your head, trying to balance all that weight with one hand while searching desperately for the mounting slot with the other. 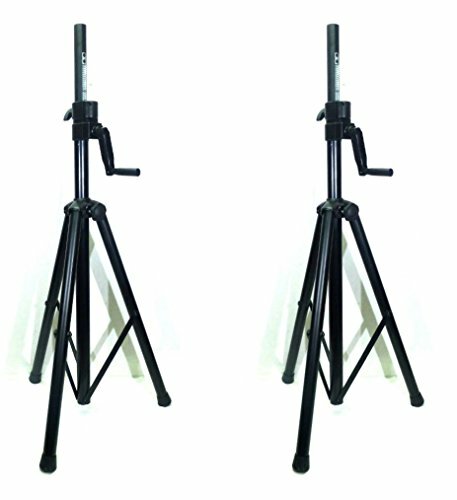 These stands support up to 80 pounds each.Once you've got the speaker in place, just crank on the folding hand crank.These stands have the gear-teeth milled right into the extruded-aluminum shaft for smooth, reliable motion, gig after gig.A friction handle locks the shaft in place to prevent slippage.When all that weight is perched up in the air, you need a strong, stable base to counteract the top-heaviness.The LASE 201C Crank-up Speaker Stand includes a locking tripod assembly with a base-spread of 18 inches. Extend the legs out wide enough to keep the stand from toppling over, preventing any unfortunate accidents. Non-slip rubber feet keep the stand in place on any floor surface, so it doesn't jitterbug-away when the bass is thumping.The stand folds up into a thin, compact shape, making it easy to tuck away. Aluminum construction Upper Shaft Tubing: 1 3/8"
Height Adjustment: 47"-80" Base Spread: 18"